Another set from knife maker Roland Lannier's Tableware's Not Dead! 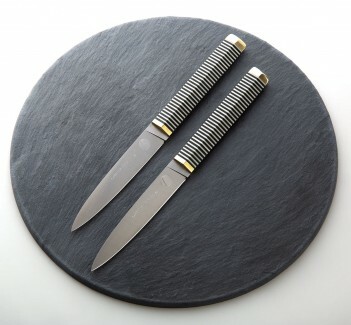 collection of steak knives—rebelling against traditional tableware manufactures and offering a new take on cutlery for the dinner table. The tips’ reversed shape minimizes edge contact with the plate, increasing sharpness lifespan. Corian, an acrylic-stone composite, is reliable, sustainable, and waterproof. Add the dramatic hollow copper pins and the Swedish-made Sandvik 14C28N stainless steel for good stain resistance and long-lasting edge, and you’ve got a steak knife set that is innovative with superior function. Made in France, these are assembled and finished entirely by hand in Roland's one-man studio. 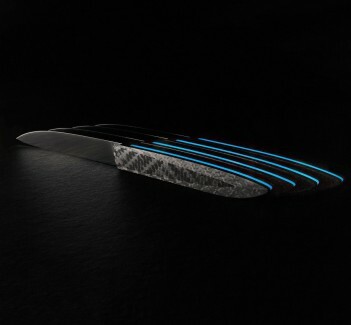 Roland Lannier, who spent 17 years working in the high-end cutlery world, has created his very first range of dinner knives. As part of his mission to take a riskier approach to tableware, he does not use any animal material or exotic wood and instead works mostly with composites made from sustainable materials or recycled products. He also uses a nitrogen-boosted steel that is cryogenically treated to achieve a hardness of HRC 60. Roland’s unique designs, specialty materials, and skilled craftsmanship come together in his exquisite dinner knives. 4.375" blade, 9.375" overall. 1.8oz. Sandvick 14C28N stainless steel. Corian & copper handle.